Bad news I'm afraid :( . . . From tomorrow I'm gonna be away and when I get back on Tuesday, that will be my last day to do homework before I go back to school on the Wednesday and so, this will be the last update for awhile. Plus, this up-coming year at school is going to be my busiest and hence, I'll have to put Mutant Manor on a bit of a back seat and won't be able to update more than once or twice a week most probably :( . Sorry about that but I will try to keep up-to-date with all the news and e-mails etc. as best I can and I still want your fanfiction and art! I'm finally all up-to-date with all the fanfiction except 'I Turn To You', so that means the final chapters of 'Forever Torn'; are posted and the latest instalment to 'New Stuff'!! Also, the word at the Comics Continuum is that the new season will begin on the 14th of September with 'Day of Recovery' and the episodes after that will be called 'The Stuff Of Heroes,' 'Mainstream,' and 'The Stuff Of Villains.' This is exciting!! The full story is below for you to read . . . The new season kicks off on Sept. 14 with an episode called "Day of Recovery." 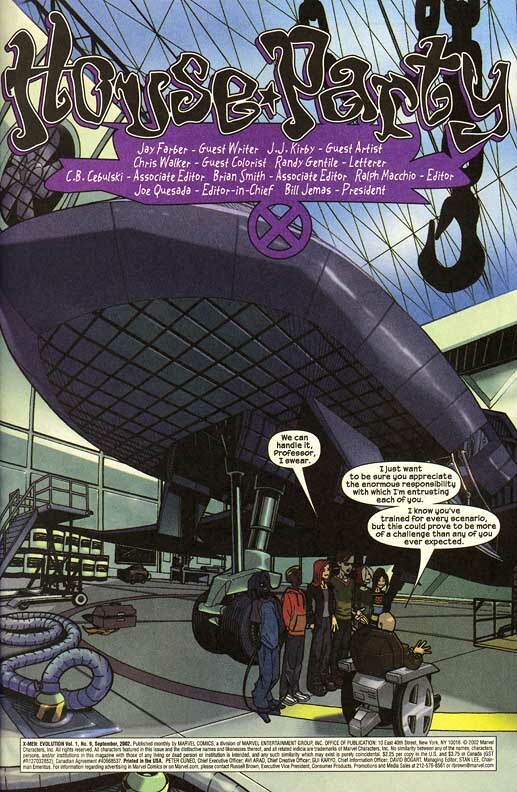 "'Day of Recovery' deals with the aftermath of the mutant reveal, and the X-Men's effort to rescue some of their fallen comrades," Johnson told The Continuum. "There are some interesting developments due to the power struggles within the ranks of the mutants, as well." Look for Mystique and Storm to play key roles in the episode. Although Kids' WB! hasn't announced its schedule beyond Sept. 14, it's likely that new episodes of X-Men: Evolution will air for three more successive weeks. Following "Day of Recovery" is "The Stuff Of Heroes," written By Bob Forward; "Mainstream," story by Johnson, written by Michael Merton; and "The Stuff Of Villains," written by Adam Beechen. Craig Kyle of Marvel Studios provided The Continuum with a production update on the third season of X-Men: Evolution, set to begin on Kids' WB! on Sept. 14. "We've gotten three episodes back from animation (overseas) and they all look strong," Kyle told The Continuum on Friday. "We expect the fourth this week." X-Men: Evolution will air on Saturdays at 11:30 a.m. for its third season, which will consist of 13 new episodes. "Fans have high expectations for this season, and I'm sure we will meet those expectations," Kyle said. * Magneto will appear more than once in the third season. I have also adopted from The Evolution Adoption Agency and The Brotherhood Files. To see the little cuties go to the Other Stuff Page. Some more lovely fan art from jci and the downloads page is ready for use! I also have a brand new short url for this site: http://beam.to/mutantmanor - isn't that much easier to remember?! Plus, don't forget to vote for the winner of the fanfic challenge or your favourite story may not win. Also, news from the Continuum about the new schedule on Kids WB! which means that all you lucky people with that channel will be able to watch the new season next month . . .
X-Men: Evolution will open its third season on Kids' WB! on Sept. 14 in the 11:30 a.m. (ET) period on Saturdays. . . Prior to X-Men's season opener, Kids' WB! will rebroadcast the two-part finale of the show's second season, "Day of Reckoning," at 11 a.m. on Sept. 7. I've had these pictures of Beast and Storm's new season civvies for a while now but forgot to post them so, here they are . . Wohooo!! 1000 hits! I love you guys and gals, mwah!! Thanks for visiting my site, especially those who have contributed to it with fanfics, art, competition entries, by signing the guestbook and by voting in spotlight. :) . . . . Anyone would think I'd won an Oscar or something! lol! Anyway, the Fanfic Challenge is now closed and the poll has gone up today for you to vote for the winner - have your say before the closing date for votes (August 30th)! Plus, new links and fan art - yes, fan art!! Wahey! 1000 hits!!!!! Yeeeehaw!! Thanks to all you visitors . . . . . . . . . . . . . . . . . . . . "Celebrate good times, come on! Celebrate them!!" ^_^ . . . . . . .
Plus, new news about the up-coming season from the Continuum . . . . .
X-Men: Evolution's third season will kick off on Kids' WB! on Sept. 14 with an episode called "Day of Recovery." The episode, which picks up on events from last season's finale, was written by Steve Granat and Cydne Clark. The story is by Greg Johnson and Boyd Kirkland. After last season's finale, where the characters were revealed to the public as mutants, expect some roster shuffling this season. "As part of the reactions of how some people respond to some of the pressures, some just won't be able to deal with it and some will disappear," producer Kirkland told The Continuum. "At least for a while. "We're going to play with who's there, who's not there, who comes and goes. And part of that is just to make interesting story telling. And part of it, too, is that the show can become really unwieldy. "With the numbers of characters we're juggling here, it becomes a pretty tough task to juggle all that in these 20-minute episodes we have to tell stories. We have to keep it all under control." * The show's time period will be announced this week by Kids' WB!. * The network has already begun advertising the season premiere, emphasizing a search for Professor Xavier. It was revealed that Mystique had been impersonating Xavier at the end of last season. I'm back! Sorry about the lack of updates recently and not replying to e-mails - I've been away since Wednesday evening and didn't get a chance to post a message notifying everyone. I'm just going off now to do all those things I said I would do a week ago and reply to some e-mails . . .
Later: I've been working hard on the Downloads page and it should be ready very soon! Yay! I've also posted the first chapter of a nice new fanfic by Barbara but unfortunately, didn't get around to answering all e-mails :( I'll try really hard to do that tomorrow and to also post the final chapters of 'Forever Torn' like I should have done ages ago . . plus, I need to do something about the rest of 'I Turn To You' . . . . ahhhh . . . . well, better get going right away then! . . .
Oh yeah, one more thing - It's the closing date for submissions to the Fanfic Challenge tomorrow and so, it looks like the contest is going to be out of just the two entries I've already been sent. Voting will start for the winner in a day or so! I have added the 'Mutant Crush' guide to the Episodes page. Also, click here to read practically the same story about the Morlocks as I reported yesterday except from X-Fan and with a new picture: a group shot of the Morlocks and one additional member Cybelle. The Morlocks will be appearing in the upcoming third season of Kids' WB! 's X-Men: Evolution. "The Morlocks are an intriguing group to me - clearly illustrating that mutants aren't the perfect race, and these unfortunate souls are proof of that," X-Men: Evolution story editor Greg Johnson told The Continuum. "We'll meet a few of them early on in brief encounters, and then a group of them are featured in one episode. Some are taken from the comics, Caliban and Callisto among them, while others have been created specifically for our series." "I needed a group to possess specific abilities and personalities useful in the episode they're in, and when I couldn't find them in the archives, I chose to develop them," Johnson said. "Included in the new creations are Lucid, who can peer through solid objects, and Facade, who can camouflage himself. " Johnson said the Morlocks won't be a big part of the cast, but they do play an important role in the life of one core character. Like most of the characters in the show, the Morlocks were designed by Steve Gordon, a director of the first two seasons who now works at Dreamworks. "My main thinking was to design characters that couldn't easily blend into normal society -- without the use of an image inducer, of course -- and I tried to create designs that somewhat reflect their powers," Gordon told The Continuum. "I also wanted to get away from that dated look of the comics while still trying to keep true to the original intent." X-Fan also reports that all the characters in season three will have new outfits and below are Kitty's and Jean's to add to the pic of Rogue I posted a few days ago. I am soo happy right now! I'm beaming away at the computer screen! Wanna know why? Because Nicole Wagner has given me her fabulous web award!! Thank you soo much Nicole!! :) - Wow! Nothing can upset me today that's for sure! . . . . .
Click here to see the award! Link bonanza!!! I have added loads more links to the, erm . . . . . Links page! Hehe! Sorry, should be concentrating on those darn character bios . . . ah, well . . .
All I can say is wohooo!! Images from the Continuum show that the people in charge of the art on X-Men: Evo have finally come to their senses as Gambit has his red eyes and trench coat!! Plus, Wolvie's got a great new uniform too and apparently a major new female character called X23 is going to be introduced. 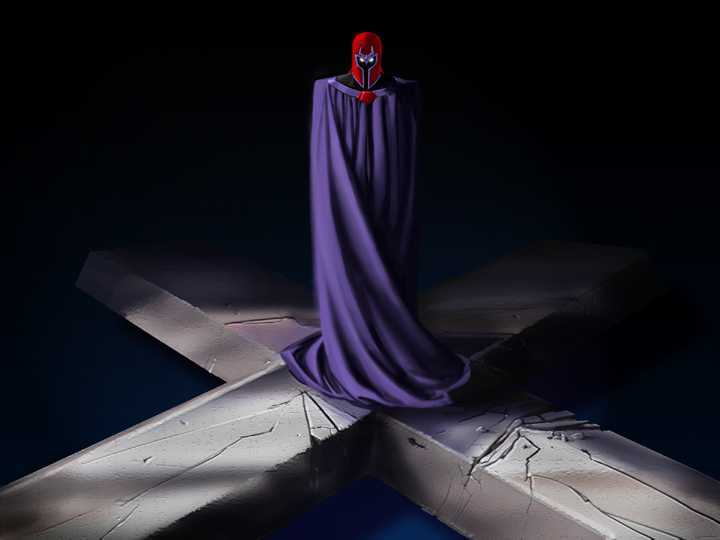 I wonder who it'll be . . . .
Plus, I forget to post this publicity picture of Magneto from X-Fan a couple of days ago . . .
Wohoo! Another profile is up and available to view - you can now go and read about Nightcrawler to your heart's content! Plus, I am now a proud member of SARB! Go to the Other Stuff page to see what all that is about! Also, yesterday, the Comics Continuum reported this news about the third season of Evolution . . . .
X-Men: Evolution will have a new opening when its third season on Kids' WB! begins in September. The new opening's format is similar to that of the opening from the past two seasons, but features images from second-season episodes and includes Beast as one of the highlighted members. Beast is now also included in the final group image. The music remains the same, only in its original, longer edit. Although Wolverine is seen in the opening wearing his orange uniform, he will be getting a new, black uniform for Season 3. * The Morlocks, led by Callisto, will appear. * A major new character will be introduced. * An episode will spotlight Rogue. * One of the X-Men's mutations will continue to evolve. * A unique combination of characters will get together on an adventure. A new link and another fantastic entry to the Fanfic Challenge by Todd Fan! There is also news form the Comics Continuum about the 9th Evolution comic. Below is the first page of the comic, click here for more information including the official summary, the cover, price and other preview pages of the actual comic! Yet another chapter of 'I Turn To You'! It's slow progress but I will eventually have the whole story posted. Plus, I made an enter page! That's it for now . . .
You can now read another chapter of 'I Turn To You' and I have some more buttons that you can use to link to me with if you want to :) I also made some changes to the layout, as you can probably see. Well, today is Saturday and I officially broke up from school yesterday for the summer which means I have a whole six weeks off!!!! Wohooo!! This means that I should be able to get a lot of stuff done on the site now and I hope to finish most pages by the end of the holidays. I already have the skeleton up of the Other Stuff page, more content will be added to it later, but if you go there you can currently find the details of a petition to convince Marvel to not cancel the Evolution comic. Firstly, I have bad news: unfortunately I had to take 'The Notes' fanfic down shortly after I posted it due to difficulties, but I promise that it'll be up again as soon as possible. Sorry about that. Updates are like buses: you wait ages for one, and then two come along at once . . .
Yup, I've got two updates for you!! The first is that I realise that this site is in desperate need of some more content and so, I have been busily working on the episode guide page - it's nearly finished. 'Nuff said . . .
Captain America will be the fourth X-Men: Evolution Maquette in the series from Hard Hero Entertainment. 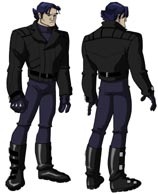 Captain America, who follows Cyclops, Storm and Professor Xavier in the Maquette series, appeared in the second-season episode "Operation: Rebirth." He was designed for the show by Steve Gordon. The Captain America Maquette will be approximately 11 inches tall and is limited to 2,500 pieces. It is targeted for late fall shipping. X-Men: Evolution producer Boyd Kirkland has been pleased with Hard Hero's work and has the Cyclops Maquette on his desk. "They're doing a real nice job," Kirkland told The Continuum. * The series will have a new title opening sequence for the third season. * Gambit ( < - - - Yay!! 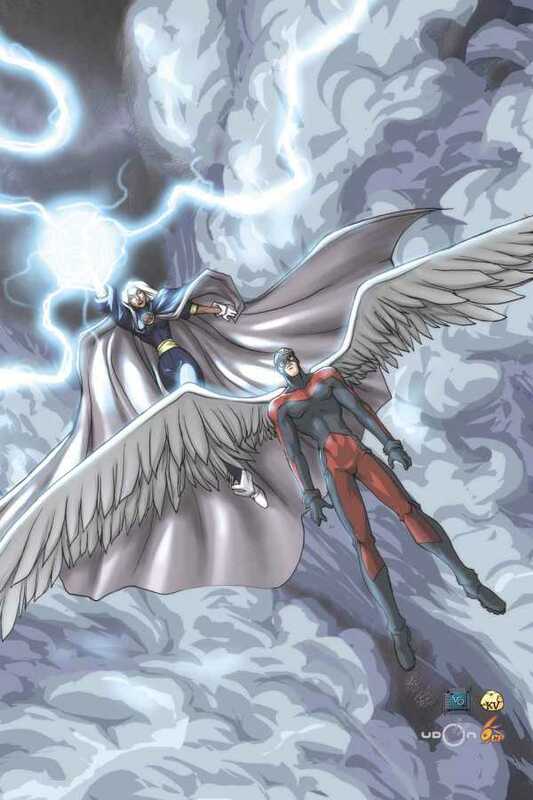 :) ) and Colossus will return in the third season, and their ties to Magneto will be explained. I just noticed the copyright notice at the bottom of the X-Fan website and so, I probably shouldn't copy the latest news about X-Men: Evolution here. However, you can still read the interview with a director of the show here. More news and hints of things to come regarding season three of evo . . . The Apocalypse story arc started in the second season of X-Men: Evolution will continue in the third season, producer Boyd Kirkland told The Continuum. "As we introduced in the second season, he's trying to get free," Kirkland said. "There was a reference to the fact that there were three keys necessary to release him, and that episode ended with the recovery of the first key. "So, in this season, there will be a couple more episodes devoted to the idea of Mesmero trying to recover the other two keys that are necessary to get him released. In the second season, that journey just barely began. "We will revisit it a couple of times in this season. But he's not going to - Boom! - pop up right up at the head of the season and be the menace for the season. That's not what's going to happen." * Look for one of the third-season episodes to focus on Rogue. * At least one of the upcoming episodes will have more of an international scope. * Look different mixes of characters in Season 3. And it begins! The first piece of news about the new X-Men: Evolution episodes has just been released at the Continuum . . .
Curt Geda, the newest director of X-Men: Evolution, told The Continuum that his first episode will spotlight Juggernaut. "The bigger scale is much more fun to me. I love the action." "I've never seen Juggernaut played so well," Marvel Studios' Craig Kyle said of the episode. "He was great in Season 1, but this time around, oh boy!" Geda joins the X-Men: Evolution directing staff with the departure of Steve Gordon, who is remaining with the show as character designer. Geda's many credits include the Batman Beyond: Return of the Joker movie. "The scripts I've gotten are among the best I've ever worked on, so it's a lot of fun," Geda said of X-Men: Evolution, which is entering its third season on Kids' WB!. I have a Links page up and running! Submit your links to me via e-mail, link to me or be an absolute star and vote for me in the top site lists - the choice is yours! In regards to site updates I'm afraid I've been rather busy for the last few weeks and consequently have not got anything done :( I hope to continue with more biographies soon and I have put Spotlight on hold for now, although you can still vote. Another update from the Continuum for ya . . .
X-Men: Evolution producer Boyd Kirkland told The Continuum that writing for the third season of the show has nearly been completed. "Story-wise, we're into the writing of the last two episodes," Kirkland said on Tuesday during The Continuum's visit to Film Roman, where X-Men: Evolution is produced. "It's going to be another two-part finale for the season like we've done for the first two seasons, where we have a big, epic kind of finish to the season. "The first part of that, the story is finished, and is now just going into storyboards. The second part of it, we're working on finalizing the script right now. We're nearing the end of the story development phase of the third season." The second season of the show ended with a cliffhanger that introduced new characters and revealed to the public the existence of mutants. "It was nice that the network let us construct a story that ended in a cliffhanger so that we can do a story that will carry on, and pick up the pieces where we left off," Kirkland said. "So ultimately it will make for a nice, big story arc." Although they've been revealed as mutants, the young X-Men will return to high school. "We're not real anxious to completely turn our backs on what the show has been, the idea that they're high school kids and they're stealing with those kinds of issues," Kirkland said. "So they are going to get back to school, but it will be under different circumstances now. The circumstances now obviously being that the world knows they're mutants. So rather than finding ways of hiding who they are, they have to find ways of coping with who they are, with the general public, including friends, peers at school and Principal Kelly. And we have some episodes that deal with those sorts of issues." Some bad news for the collectors of the comic - it seems that it is going to be cancelled, as reported by X-Fan. And not that it's important anymore but it appears that it was indeed Mr. Sinister on the front cover of issue 10. Guess we'll never find out what all that was going to be about . . . According to Diamond Comics Distributors, Marvel Comics' X-Men: Evolution comic book is to be cancelled with July's issue #9. Despite being solicited in last month's Previews retailer catalog, August's issue #10 - which was set to introduce the threat of Mr. Sinister to the X-Men: Evolution universe - will not ship. Issue #9 is scheduled to be a fill-in issue by former New Warriors and Generation X writer Jay Faerber with art by J.J. Kirby (see 'Faerber Fills In On X-Men: Evolution Comic' for more details). Issue #8, which will now be the last by the regular creative team of writer Devin Grayson and artists from UDON Studios, is due to ship next Wednesday, June 26. Finally! I have finished the Rogue bio! Well, well, well. Those of you who collect the X-Men: Evolution comic book may be surprised/excited/whatever! to note that it appears that Mr. Sinister is in issue #10 as he is on the cover below. At least it looks a bit like Sinister . . . . Speaking of which, does anyone know if they sell the Evolution comic over here in the UK? Oh yeah, and in the way of site progress I have managed to add a bit more to the Rogue bio . . I have a brief outline of the Links and the bio for Rogue done but not much real content at the moment . . . sorry about that! Curt Geda, whose credits include Batman Beyond: Return of the Joker, has joined the directing crew of X-Men: Evolution. Geda joins returning directors Frank Paur and Gary Graham, as well as producer Boyd Kirkland. Steve Gordon, who directed episodes in the first two seasons, continues to be the character designer. 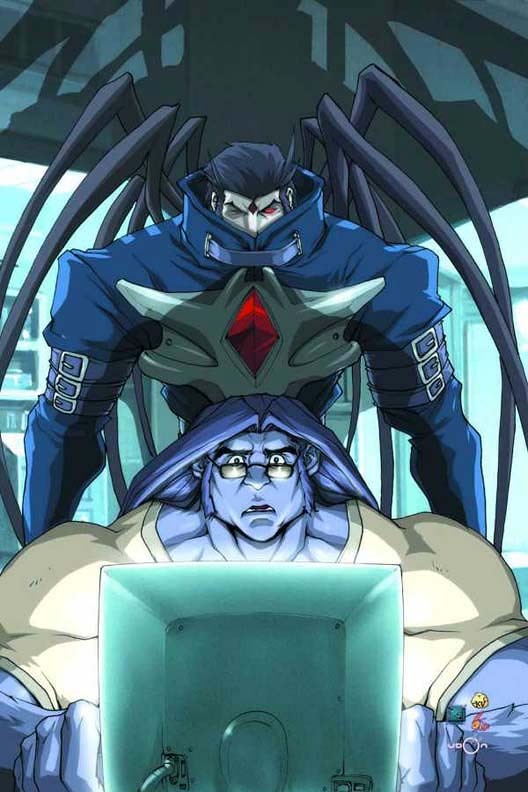 Work has begun on the third season of the series, with early episodes sent overseas for animation. "Next season is going to be off the hook," said Marvel Studios' Craig Kyle. "We're going to raise the bar again." Today, I added the first poll to the Spotlight page - so vote there for your first choice. Also, I added the main Characters page listing all of the humans/mutants I intend to feature, although no actual content yet . . .
Alright! I actually have some content! Wahoo!! Check out the Quotes page why don't ya? And feel free to send me anything else that you want to in the mean time, like quotes, fan fics and art. I am up and running! Wahoo! Although none of the links take you anywhere yet, it's a start right? . . . right? . . . . . .